Although the risk of an actinic keratosis transforming into a squamous cell carcinoma (SCC) is very low, this risk increases over time and with larger numbers of lesions. from use of sun beds. This grading system has formed the basis of the Primary Care Dermatology Society (PCDS) Actinic (solar) keratosis primary care treatment pathway on the management of actinic keratosis in primary care.3The pathway is available here. This guidance is due to be updated in the near future, to include newer topical agents that have been developed to treat actinic keratoses. Please see the PCDS website (www.pcds.org.uk) for further details. Most patients with precancerous skin lesions can be managed by their GP or by a clinician working in the community,1 but specialist referral should be made in the situations below. is very young—consider xeroderma pigmentosum. It should be remembered that actinic keratoses are an indication of significant sun damage and so a full examination of the skin is recommended to exclude other skin cancers, which is considered good clinical practice. By contrast, the British Association of Dermatologists 2007 guideline advocates no treatment where there is little clinical concern and the patient is not troubled by the lesions.8 Fifteen to twenty-five percent of actinic keratoses resolve spontaneously within 12 months,9 with less than 1 in 1000 per annum developing into SCC.10 The PCDS guideline 3 provides further guidance as to whether treatment is needed and sets out the range of options. potential changes in lesions and what to look out for. ablative—treatments that physically destroy the actinic keratoses. These may be appropriate for confidently diagnosed individual hyperkeratotic lesions, especially where patients cannot or do not wish to apply creams. topical—particularly useful for diffuse and/or widespread thinner lesions, especially field treatments. Although all modalities of actinic keratosis treatment can be delivered in primary care, photodynamic therapy (see below) needs economy of scale, making it more suitable for a GP with special interest, or secondary care, clinic. Cryotherapy using liquid nitrogen is less popular in GP surgeries because of health and safety requirements. Photodynamic therapy has similar efficacy rates to cryotherapy and 5-fluorouracil (5-FU) (see below). However, patients have rated cosmetic outcome and satisfaction more highly for PDT than for cryotherapy.15 New treatment modalities have been developed using portable, disposable light sources so that patients can remain ambulatory while receiving PDT; this reduces health practitioner time and offers wider availability of the treatment to patients. Despite its advantages, PDT is limited by the high costs of the light source and photosensitising cream, which increase the tariff costs for the procedure. Additionally, there may be considerable pain in the affected area during and after treatment. Other ablative options include surgical excision of actinic keratoses where SCC is suspected. This ensures a correct clinical diagnosis (through biopsy) and simultaneously treats the patient effectively. 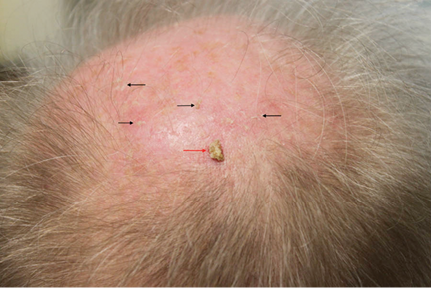 Where topical choices are contraindicated, curettage and cautery, and shave biopsy, are also effective therapies for larger actinic keratoses.3 Shave biopsy often makes interpretation of the pathology easier because the architecture of the specimen is preserved. Ablative treatments that are rarely used include laser treatments using carbon dioxide, chemical peels, and dermabrasion. These are more likely to be used outside the UK due to their expense and to safety legislation. As a result of the increasing incidence of actinic keratosis, a number of topical therapies have evolved, which can be used in primary care.3 A summary of these treatments is given below. The topical chemotherapeutic agent, 5-FU, has been used in the treatment of actinic keratosis since 1962. It works by disrupting deoxyribonucleic acid (DNA) and ribonucleic acid (RNA) synthesis, which results in apoptosis of the dyplastic skin. It is used twice daily for 3–4 weeks.19,20 When used twice daily for 3 weeks, 5-FU has demonstrated a 70% decrease in size of the area treated,21 though there are recurrence rates of 55%.22 Treatment can cause a vigorous inflammatory reaction, which leads to pain, itching, and even ulceration with scarring. It is vital that patients are counselled in advance about the side-effects they should expect, so they are more likely to comply with treatment. Although less intensive treatment regimens have been used, which provoke fewer severe side-effects (for example, 5-FU application twice-weekly for 10 weeks), their efficacy is debatable, in the authors’ experience. Imiquimod 3.75% is now also available for treating actinic keratosis of the face and scalp using a simplified daily dosage regime (2 weeks on, 2 weeks off, and another 2 weeks on).19,20 There appear to be less severe side-effects in the authors’ experience, compared with the 5% formulation, and as the whole scalp or face can be treated at one time, it offers another treatment option. 500 µg/g gel applied to the trunk or extremities once daily for 2 days. it is useful where compliance may be an issue. promoting an inflammatory response characterised by infiltration of immunocompetent cells. Controversy about the need to treat all actinic keratoses, and about whether we should treat the ‘field’ rather than just individual lesions, divides the dermatological community. In Europe and the US, there is a strong feeling that all actinic keratoses are pre-malignant and should therefore be eradicated whenever they appear. In the UK, opinions are more weighted towards treatment only when lesions are numerous, more severe, and influenced by the patient’s wishes. To treat all lesions (in the authors’ opinion) would not only be prohibitively expensive, but would also cause significant unnecessary morbidity. There is a place for all modalities of treatment, since every patient is different and has unique circumstances and tolerances. It falls mainly to GPs to develop the therapeutic choices which suit their patient. Commissioners, in association with colleagues in public health, should consider public information campaigns about safe sun exposure and the identification of actinic damage and possible skin cancer. Friedmann P. Prevalence of solar damage and actinic keratosis in a Merseyside population. Br J Dermatol 2000; 142 (6): 1154–1159. Moy R. Clinical presentation of actinic keratoses and squamous cell carcinoma. J Am Acad Dermatol 2000; 42 (1 Pt 2): 8–10. Röwert-Huber J, Patel M, Forschner T et al. Actinic keratosis is an early in situ squamous cell carcinoma: a proposal for reclassification. Br J Dermatol 2007; 156 (Suppl 3): 8–12. de Berker D, McGregor J, Hughes B on behalf of the British Association of Dermatologists Therapy Guidelines and Audit Subcommittee. Guidelines for the management of actinic keratoses. Br J Dermatol 2007; 156 (2): 222–230. Marks R, Foley P, Goodman G et al. Spontaneous remission of solar keratoses: the case for conservative management. Br J Dermatol 1986; 155 (6): 649–655. Harvey I, Franklel S, Marks R et al. Non-melanoma skin cancer and solar keratoses. I. Methods and descriptive results of the South Wales Skin Cancer Study. Br J Cancer 1996; 74 (8): 1302–1307. Primary Care Dermatology Society website. 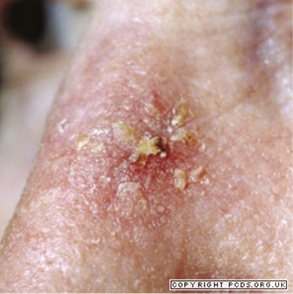 Actinic keratosis (syn. solar keratosis). www.pcds.org.uk/clinical-guidance/actinic-keratosis-syn.-solar-keratosis (accessed 11 October 2013). Thompson S, Jolley D, Marks R. Reduction of solar keratoses by regular sunscreen use. N Engl J Med 1993; 329 (16): 1147–1151. Quaedvlieg P, Tirsi E, Thissen M et al. Actinic keratosis: how to differentiate the good from the bad ones? Eur J Dermatol 2006; 16 (4): 335–339. Morton C, Brown S, Collins S et al. Guidelines for topical photodynamic therapy: report of a workshop of the British Photodermatology Group. Br J Dermatol 2002; 146 (4): 552–567. Morton C, Campbell S, Gupta G et al. Intraindividual, right-left comparison of topical methyl aminolaevulinate—photodynamic therapy and cryotherapy in subjects with actinic keratoses: a multicentre, randomized controlled study. Br J Dermatol 2006; 155 (5): 1029–1036. Szeimies R, Karrer S, Radakovic-Fijan S et al. Photodynamic therapy using topical methyl 5-aminolevulinate compared with cryotherapy for actinic keratosis: a prospective, randomized study. J Am Acad Dermatol 2002; 47 (2): 258–262. Rivers J, Arlette J, Shear N et al. Topical treatment of actinic keratoses with 3.0% diclofenac in 2.5% hyaluronan gel. Br J Dermatol 2002; 146 (1): 94–100. Martin G, Stockfleth E. Diclofenac sodium 3% gel for the management of actinic keratosis: 10+ years of cumulative evidence of efficacy and safety. J Drugs Dermatol 2012; 11 (5): 600–608. British National Formulary website. www.bnf.org/bnf/index.htm (accessed 2 October 2013). Kurwa H, Yong-Gee S, Seed P et al. A randomized paired comparison of photodynamic therapy and topical 5-fluorouracil in the treatment of actinic keratoses. J Am Acad Dermatol 1999; 41 3 Pt 1): 414–418. Stockfleth E, Kerl H, Zwingers T, Willers C. Low-dose 5-fluorouracil in combination with salicylic acid as a new lesion-directed option to treat topically actinic keratoses: histological and clinical study results. Br J Dermatol 2011; 165 (5): 1101–1108. Korman N, Moy R, Ling M et al. Dosing with 5% imiquimod cream 3 times per week for the treatment of actinic keratosis: results of two phase 3, randomized, double-blind, parallel-group, vehicle-controlled trials. Arch Dermatol 2005; 141 (4): 467–473. Gaspari A, Sauder D. Immunotherapy of basal cell carcinoma: evolving approaches. Dermatol Surg 2003; 29 (10): 1027–1034 . Lebwohl M, Swanson N, Anderson L et al. Ingenol mebutate gel for actinic keratosis. N Engl J Med 2012; 366 (11): 1010–1019. Berman B. New developments in the treatment of actinic keratosis: focus on ingenol mebutate gel. Clin Cosmetic Investig Dermatol 2012; 5: 111–122. Rosen R, Gupta A, Tyring S. Dual mechanism of action of ingenol mebutate gel for topical treatment of actinic keratoses: rapid lesion necrosis followed by lesion-specific immune response. J Am Acad Dermatol 2012; 66 (3): 486–493.